The San Jose Blog: Fogo de Chão Now Open at Santana Row! Fogo de Chão Now Open at Santana Row! Epic Brazilian Churrascaria, Fogo de Chão, has opened their first Northern California restaurant in Northern California at Santana Row. The restaurant is massive--clocking in at about 9,000 SQFT with seating for 250 people, outdoor dining, private dining, and a sizable bar. I had the opportunity to try out the restaurant during the soft opening last week, and was not disappointed. In fact, I think this is the best Brazillian Steakhouse that I have been to, including Pampas in Palo Alto, Espetus in San Mateo, and Maceio which was in Downtown San Jose. When you visit, my recommendation is to come very hungry. They food is all-you-can-eat with a special focus on amazing steaks. Gauchos carve one of 16 different meat variations right at your table. These range from bacon wrapped filet mignon, to legs of lamb, beef ribs, linguica sausages, Parmesan pork loin, and my favorite by far... the Picanha. To complement the meats they have a whole side bar of veggies and sides. I recommend getting a plate of rice, topping it with black beans, then adding a traditional Brazilian topping called farofa (you have to ask for it) with some hot red sauce. This goes well with all of the meats. Also, you can't leave without trying a Caipirinha, a traditional Briazilian drink with Cachaca, lime, and sugar. Lastly, for dessert you must have the flan and the cheesecake. At this point, you will feel like you are about to explode, but believe me it is worth finding some room for these. For lots of photos and a thorough review, I would recommend checking out Ngoc's post at the San Jose Food Blog. That is also where I stole the photo below. 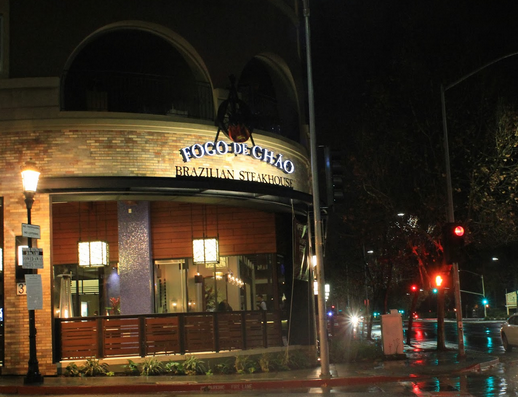 SAN JOSE, Calif. (February 25, 2014) — Internationally renowned Southern Brazilian Steakhouse, Fogo de Chão (pronounced fo-go dèe shoun), opens its first Northern California location on Thursday, February 27, 2014. The restaurant, which offers upscale Churrasco(barbeque) cuisine, is located at Santana Row in San Jose, Silicon Valley’s premiere destination for shopping, dining, living, and more. “We are excited to celebrate our first restaurant in Northern California in the heart of Silicon Valley and join the community at Santana Row,” says Fogo de Chão Chief Executive Officer Larry Johnson. “Like Brazil, the Bay Area is home to some of the best food in the world. We are looking forward to introducing the Southern Brazilian Steakhouse experience and the culinary traditions behind it to San Jose. The Fogo de Chão dining experience is based on the centuries-old gaucho tradition known as churrasco, the art of roasting meats over an open fire, and sharing dining experiences with family and friends. To see the story of Fogo de Chão from the perspective of one of their gauchos, visit the documentary-style video recently filmed on a return trip to the farms of Brazil by clicking here. The menu focuses on 16 cuts of meat including beef, chicken, pork, and lamb carved tableside by a team of Brazilian trained gaucho chefs, led by Head Gaucho Chef Helio dos Santos Vieira. The prix-fixe experience invites guests to dine at their own pace using a double-sided, red and green disk indicating when they are ready to try the various selections of meat. This approach allows them to enjoy a variety of meats with each new cut coming right from the grill and carved tableside. Highlights include the Picanha, the prime part of the sirloin, seasoned with sea salt or flavored with garlic – a Brazilian specialty; Cordeiro,fresh leg of lamb flavored with a special mint marinade and sliced off the bone; and Fraldinha, a bottom sirloin cut that is one of the most distinctive and flavorful cuts of meat from Southern Brazil. The restaurant also features a gourmet salad and side bar with more than 30 selections of fresh cut vegetables, cured meats, cheeses, and traditional Brazilian side dishes including Pão de Queijo – a warm cheese bread,Crispy Hot Polenta, Garlic Mashed Potatoes, and Caramelized Bananas. The menu is complemented by an award-winning 200 label wine list featuring selections from around the globe including Malbec and Carmenère varietals from South America, to Chardonnay, Cabernet Sauvignon, and Pinot Noir from the Napa Valley and Sonoma Valley. The restaurant also boasts a South American-inspired cocktail program, including many traditional drinks from Brazil, such as the Caipirinha, as well as a selection of Brazilian and domestic beers, premium liquors, after-dinner drinks and non-alcoholic beverages. The dessert menu features indulgences such as Fogo de Chão Signature Papaya Cream, Key Lime Pie, and Molten Chocolate Cake. The nearly 9,000-square-feet, 250-seat restaurant, located on the corner of Winchester Boulevard and Olin Avenue at Santana Row, blends contemporary Northern Californian and Brazilian design and features a mix of textures, colors and materials. In addition to the main dining area, Fogo de Chão features outdoor seating, a lively bar, and three semi-private dining areas that can be combined to make larger rooms, seating from 22 to 110. With its location in the heart of Silicon Valley the restaurant was designed with the tech-savvy crowd in mind, offering fully connected private dining spaces including touch screen televisions and 60-inch projector screens, wired for everything from presentations to video conferencing. The focus on technology also flows into the bar area, which features numerous AC and USB outlets for charging phones and laptops as well as complimentary Wi-Fi. Fogo de Chão is located at 377 Santana Row in San Jose, California. It is the 23rd location in the U.S., with 32 restaurants worldwide. Monday through Friday 11:30 a.m. - 2:00 p.m.
Monday through Thursday 5:00-10:00 p.m.
Children 6 and under are complimentary. Children 7 to 12 are half price. Any beverages, desserts, tax, and gratuity are additional. An 18% gratuity is added to all parties of 6 or more. For more information, please visit www.fogo.com. Follow FOGO on Facebook. Fogo de Chão® Churrascaria - Brazilian Steakhouse was founded in 1979 in Porto Alegre, Brazil and expanded into the U.S. in 1997. There are currently 22 locations throughout the United States and nine locations in Brazil with the recent openings in New York City and the Jardins neighborhood of São Paulo. A location in Portland, Oregon will follow in 2014. For more information, please visit www.fogo.com. Follow FOGO on Facebook. Been to the Las Vegas location, and they have pineapple there (it's also one of my favorites!). Hopefully the SJ location adds that.